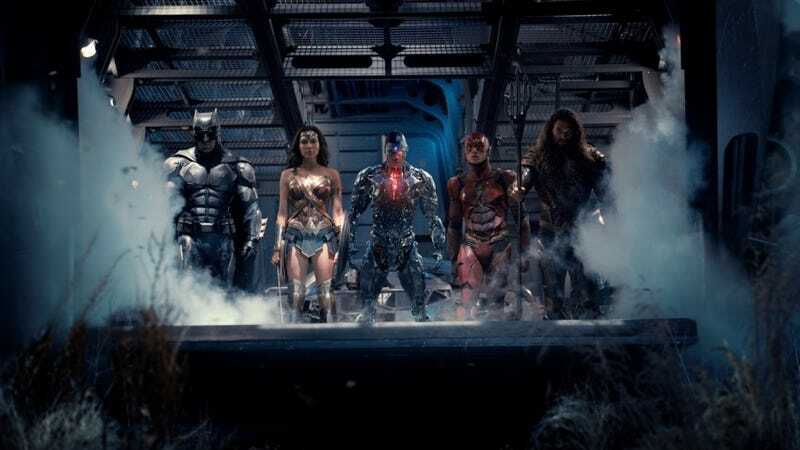 Batman, Wonder Woman, Cyborg, The Flash, and Aquaman are finally side-by-side and in action in the latest image from Justice League. And since it’s a Zack Snyder movie, obviously it’s going to have a bunch of looming fog. Still, Snyder’s right to call them a bunch of badasses. “It was all about the filling-out of this massive comic-book pantheon with the biggest and coolest heroes we could,” Snyder said. The image was shared as part of USA Today’s 2017 film preview of the upcoming film, about Batman (Ben Affleck) and Wonder Woman (Gal Gadot) bringing together a group of superheroes to fight the world’s latest threat after Superman’s death. Now, obviously Superman’s coming back at some point, but for the most part, it’ll be this team of five against Steppenwolf. Justice League comes out November 17, after Wonder Woman makes her solo debut on June 2.